Indie sci-fi FPS Morphite’s core concept of mixing No Man’s Sky’s procedurally generated planets and creatures with some Metroid Prime-style FPS platforming and scanning sounds like a game design home run. How could it possibly go wrong? By being boring, that’s how. Having a potentially infinite number of planets to explore doesn’t mean much then they are all just barren deserts with one or two things to do, but that’s Morphite in a nutshell. Maybe the concept proved to be too ambitious for the devs, but Morphite is pretty disappointing. See our full Xbox One review for more. Morphite is the tale of a girl’s search for an extremely rare and valuable resource known as, you guessed it, morphite. With the help of a scientist / inventor friend, she is able to travel to distant planets in search of resources, materials, and information on the mysterious morphite and how it helped shape the known universe. The actual gameplay, unfortunately, isn’t quite up to par with the lofty ambitions of the story. Playing in a first-person-perspective your job is to travel to various planets in order to scan plant and animal life and mine mineral deposits (and kill stuff …) for resources. The idea is that you sell the scans for money and then use the money and resources to buy upgrades for your space ship as well as your weapons and other items. And you’ll need a LOT of money and a TON of resources because everything is crazy expensive. And thus begins the gameplay loop at the core of the experience that is stretched out into a full game. Story-important planets were specifically crafted, but the other planets you can visit are procedurally generated. This should provide some decent variety to the plant and animal life you’ll find, and it does, but there are only ever a couple of different species on each planet. The gameplay loop of - land on planet, scan everything, kill everything, mine all minerals, get on ship to go to the next planet – gets really repetitive, really fast because there just isn’t all that much interesting stuff to see. It also doesn’t help that the planets – at least the small areas on each you can actually explore – are only ever weirdly barren and empty boring mostly lifeless deserts with a couple of alien looking plants and a couple of doofy looking animals. There just isn’t enough content to engage with to make any of it interesting. The gameplay mechanics are a bit off as well. Everything is really loose and floaty feeling. Granted, none of the enemies ever put up much of a fight (they mostly just sort of lazily run at you, really) and the platforming never requires much precision, but it doesn’t feel particularly good to play. So, in other words, not only does the game not give you anything especially interesting to look at and explore, but it isn’t engaging to play either. It’s all competently built, but boring as heck. 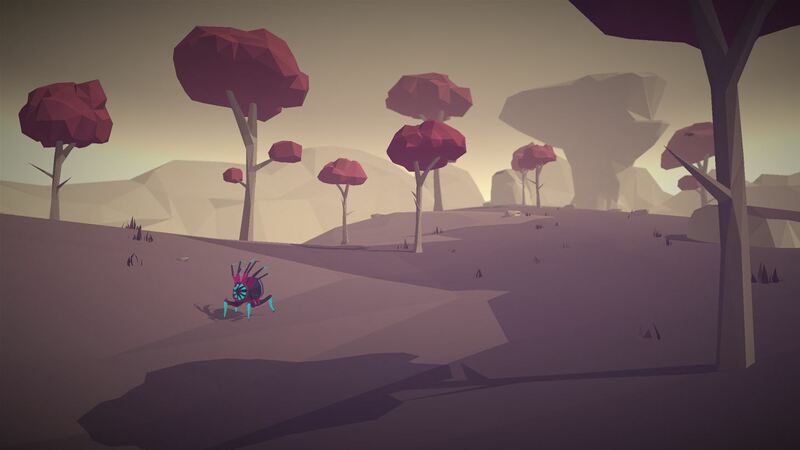 Morphite’s most distinctive feature is its flat low poly art style. I actually find the brightly colored, though textureless, visuals to be pretty appealing, so it’s a shame the game around them isn’t better. The sound is also fairly solid with good music and sci-fi sound effects, though the voice acting in cutscenes isn’t spectacular. 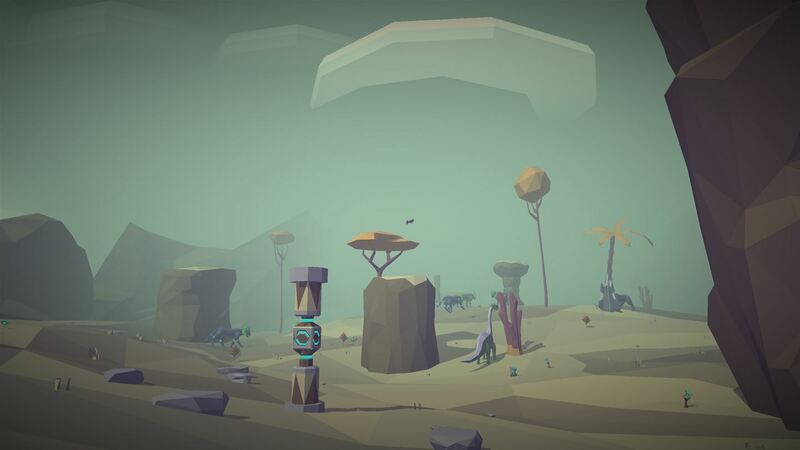 I’ll be honest; the main reason why I wanted to play Morphite was because there were dinosaurs in the preview videos. I’m a sucker for anything with dinosaurs, so the promise of a sci-fi exploration game with planets full of dinosaurs had my full attention. For the game to end up so lame and limp and boring and repetitive and even the encounters with dinosaur creatures to be so uninspired and unsatisfying, well, Morphite is pretty disappointing. I can’t recommend it. Skip it.